Yesterday marked the beginning of the CW’s epic four-night crossover event, “Heroes v Aliens” (sigh)... or so we were told. As last night’s Supergirl revealed, however, that’s a bit of a lie. Turns out we’re in for a three-night event, plus maybe a couple of minutes. Because Supergirl was basically just a regular episode of Supergirl last night. Cadmus released a virus bomb that could kill all aliens other than Kryptonians (courtesy of a bioweapon designed by Kara’s parents. Bummer! 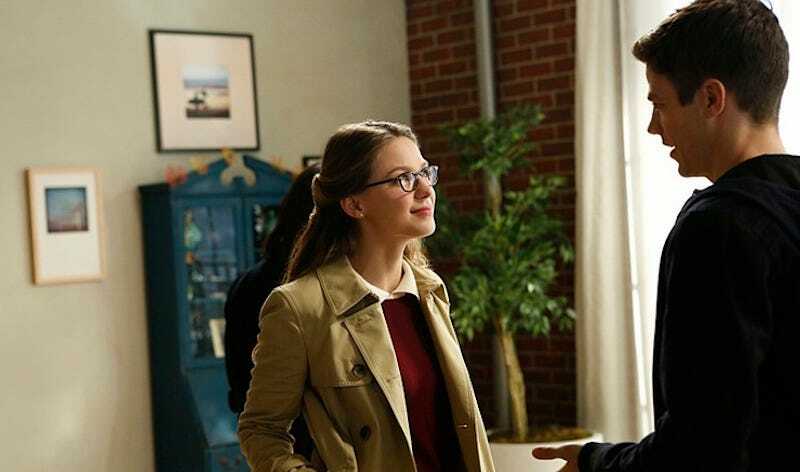 ), Lena Luthor revealed herself to be truly good, Alex finally accepted herself, Maggie finally admitted she had the hots for Alex, and the two shared an extremely satisfying first kiss, while Kara and space bro Mon-El, feverish from contracting the virus, shared an equally unsatisfying kiss which Mon-El promptly forgot happened. All in all, It was good, and cute, and Melissa Benoist is the last ray of hope in this dark world. Same old, same old. But anyone hoping the crossover would actually begin was surely disappointed. 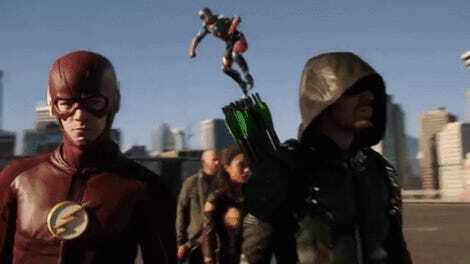 Really, all that happened was in the very final minutes of the episode Barry brought Cisco (or Cisco brought Barry) into Kara’s reality to ask for her help to... well, v some aliens, presumably. It was a prologue at best, and really, given that no information was imparted in the scene, a completely unnecessary one. If you skipped Supergirl and just watched The Flash tonight, you wouldn’t have missed a thing. That said, it seems like tonight we won’t have that problem. I wonder if Supergirl was basically excused from participating because of the showrunners didn’t want to interrupt its storyline, or if they didn’t have enough money to truly make a four-night event, or if it’s still because Supergirl, having started on CBS, is still sort of a unique beast among the DC/CW shows. Maybe a bit from all columns?